Robertson Quay is my favourite dining area in Singapore – in fact, I go there almost every week. 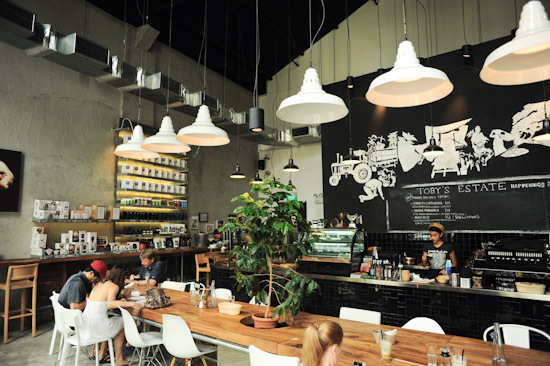 One of the places that I went to a while back is Toby’s Estate, a renowned coffee chain from Australia. I first learnt about Toby’s Estate through some friends. They were raving about the coffee, even to the extent of proclaiming it as one of the best coffee joints in town. When I was meeting Beatrice and Velda for brunch, I suggested going to Toby’s Estate, and while the food did not blow us away, the coffee was excellent, and the company was even better. For those who like to sit in the al fresco area, Toby’s Estate has a few table outside where you can have a cup of coffee facing the river. Otherwise, there’s always indoor seating, but the large communal table in the middle means that it is probably not a place that you would like to linger, especially if you are in a big group. Most of the items on the food menu were priced below $20, and we shared a mac & cheese, big breakfast, eggs benedict, and prosciutto panini. They were decent, but not fantastic – meaning I would not come here specifically just for the food. I will be honest: Toby’s Estate is not one of my favourite brunch spots. However, it has very good coffee – in fact I have been here a few times for my caffeine fix – and if you are working or living in the area, I am sure that it will become your new to-go coffee place. u should try pies and coffee at rochester park too! they use toby’s estate’s beans there! There is a french bakery called Hediard at Tudor Court near Tanglin Mall. It serves pastries and gourmet coffee. The one in Robertson Quay is loads better than the one that recently opened here in Manila. I guess because the beans are already there in Singapore.